Emmy-winner Patrick Greene films Mike Heithaus and a wildlife veterinarian for a video-based project. 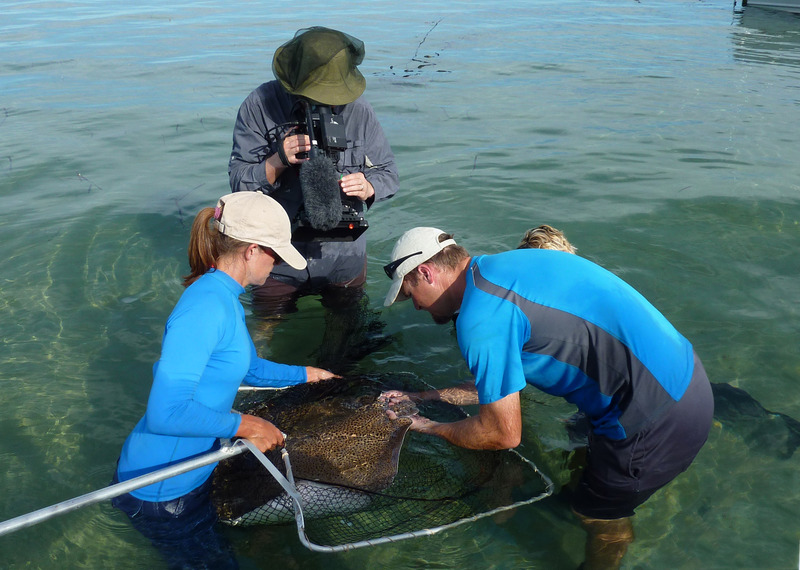 Mike has been involved in the production of more than a dozen natural history documentaries and developed video-based curriculum for K-12 classrooms across the country. In partnership with Houghton Mifflin Harcourt and SymbioStudios, Mike hosted and co-produced 30 project-based video lessons and 135 90 – 120 second videos that connect students to real-world applications of math as part of their national Go Math Program. Cindy Bessey and Mike Heithaus tag a whipray while Patrick Greene films. The concept for video-based projects was developed with Patrick Green of SymbioStudios during NSF-funded work in Shark Bay, Australia. These supplemental class materials introduce students to an ecosystem or scientific problem and then alternate between 2 – 4 min production-quality video clips and engaging written activities for the students. The projects are built so students develop their own hypotheses, see the data collection process, test their hypotheses with data, and then use these data to make further predictions. Dr. Mike hosts the videos, which feature a variety of scientists from the Heithaus lab conducting the research. Since the introduction of the Shark Bay video lessons, Mike has worked with SymbioStudios to enhance science instruction in the classroom by producing 30 video based lessons and class activities, including Houghton Mifflin Harcourt’s national science programs, which reinforce important scientific concepts and methods. These videos highlight research from the Heithaus lab and inspiring scientists from around the world. In addition, Mike has developed supplemental teacher instruction materials to help teachers engage their students in meaningful and memorable discussions about the material. Currently, the lab and SymbioStudios are working to develop new video-based projects for elementary school classes based on research on the coral reefs and sharks of French Polynesia. Check back soon!